All republican and left-wing groups have committed to support local demonstrations taking place today [Saturday, November 1] in every county across Ireland as part of the ‘Right2Water’ campaign. 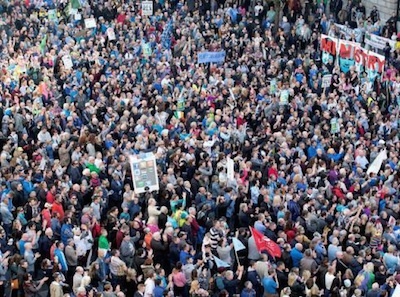 The protests are expected to be the largest Ireland has seen in decades. Following on from one of the largest national demonstrations in Irish history, the Right2Water campaign says it will continue to build a mass movement of opposition to water charges. The campaign - which involves trade unions, political parties and community groups - believes people are angry and unified in their opposition to these unfair charges. The campaign is asking all anti-water charges groups - including political parties - to unify and work together to ensure as large a demonstration as possible in their home towns and cities. In order to be involved in the campaign you only need to have two beliefs: Water is a human right; and Water charges should be abolished. Another national demonstration will be organised in the coming weeks as the campaign continues to grow. Here are today’s local demonstrations. Carlow, Carlow, 2pm Liberty Tree. Clare, Ennis, O’Connell Monument 2pm. Clare, Shannon, Shannon Town CTR Carpark (behind Kincora). Cork, Bandon, 12pm Main Bridge. Cork, Cork City, 2pm, Library, Grand Parade. Cork, Fermoy, 2pm Chapel Square. Cork, Mallow, 2pm, assemble at the west end of Mallow. Cork, Youghal, Barry’s Lane, 1pm. Dublin, Artane, 11am, Our Lady of Conselation Car Park. Dublin, Dublin 15, Blanchardstown, various community demonstrations convening at the Blanchardstown town centre at 1pm. Dublin, Ballyfermot, 1pm Civic Centre. Dublin, Blanchardstown, Bank of Ireland, Blanchardstown Village, 1pm. Dublin, Cabra, 12pm Cabra Bingo Hall. Dublin, Cabra, 2pm, Naomh Fionnbarra GAA Club. Dublin, Dublin Central, Phibsboro, St Peter’s Church , 1pm. Dublin, Clondalkin, 2.30pm from County Council. Dublin, Coolock, Stall Northside Shopping Centre. Dublin, Crumlin, 1pm Crumlin Shopping Centre. Dublin, Donaghmede/Kilbarrack, 11:30am, Donaghmede Shopping Centre. Dublin, Donnycarney, Stall at Donnycarney Church. Dublin, Drimnagh, 1pm Galtymore Shops. Dublin, Dun Laoghaire, 1pm Glasthule Dart. Dublin, Greenhills (D12), Greenhills Church, 1:30pm. Dublin, Lucan, 2pm, Lucan Community Centre. Dublin, North Inner City, 12 noon, Meet at Five Lamps, North Strand. Dublin, Rialto, 12:30pm, Ardee St/Cork St.
Dublin, Ringsend, 12:30 Ringsend Library. Dublin, Stoneybatter, 12pm, Tesco Car Park, Prussia Street. Dublin, Tallaght, 11am Dominican St. Mary’s Priory Tallaght. Dublin, Walkinstown, 1:30pm, Lidl, Walkinstown Avenue. Fingal, Swords, 11.30am Pavilions March to Fingal Co.Co. Galway, Ballinasloe, Library Car Park, 4pm. Galway, Galway, 1pm Spanish Arch. Kerry, Tralee, 1pm Horan Centre. Kildare, Athy, 1.45 The Arches, Athy. Kildare, Celbridge, 12pm Rally Castletown Gates. Kildare, Leixlip, Rally meeting point Leixlip Fire Station 2pm. Kildare, Maynooth, 1pm, The Square. Kildare, Naas, 1:30pm The Courthouse. Kildare, Newbridge, 2pm Ballymany shops, Newbridge. Kilkenny, 1:30pm, Assemble at the train station. Laois, Portarlington, 2pm, Carpark of School across from St Michael’s Church. Laois, Laois County Hall Car Park, 2pm. Leitrim, Carrick-on-Shannon, 1pm, Tesco Car Park. Limerick, Limerick City, 2pm Bedford Row. Louth, Ardee, 2pm Catholic Church. Louth, Drogheda, 2pm O’Rahallaigh’s GAA club to Shop Street. Meath, Navan, 2pm Fair Green. Meath, Kells, Rally starting at 2pm at Fair Green Kells. Meath, Ashbourne, Arkle Statue 2pm. Meath, Duleek, Duleek Village 12 noon. Mayo, Ballina, 1:30pm, Diamonds Carpark. Mayo, Castlebar, 1pm, Market Square. Offaly, Birr, 2pm, Old Post Office, Emmet Square. Offally, Tullamore, 2pm, GAA Arden Road. Roscommon, Boyle, 1:30pm Royal Hotel Carpark. Roscommon, Roscommon Town, 2pm The Mart. Sligo, Sligo, 2pm GPO Sligo. Tipperary, Cashel, 1:45pm, The Plaza, Main Street. Tipperary, Nenagh, 2pm, Railway Square. Tipperary, Roscrea, 3pm, Tesco Carpark. Tipperary, Tipperary Town, 3:45pm, Redmund Square. Waterford, Portlaw, 12 noon, Main Village. Waterford, Waterford City, Ballybricken Hill 2pm. Westmeath, Athlone, 2pm, St Peters Church. Westmeath, Mullingar, 2pm, Penneys Car Park. Wexford, The Quay, New Ross, 2pm. Wexford, Enniscorthy, 2pm, Fairgreen, Enniscorthy. Wexford, Gorey, 2pm, Gorey Community School Car Park. Wexford, Wexford Town, 2pm, Riverbank Hotel. Wicklow, Blessington, 12pm, Aldi Car Park. Wicklow, Bray, 2pm. Three assembly points: Lidl, Dell Boghall Rd. or St Fergals Church. Wicklow, Greystones, 2pm from Civic Offices Mill Rd. Wicklow, Wicklow, 12.30 Wicklow County Council. Wicklow, Arklow, Fr. Murphy Monument, Parade Ground 1.45pm.